HABA 2297 - Pile them up and be amazed. Thanks to their optical effects these beautiful blocks will fascinate children. 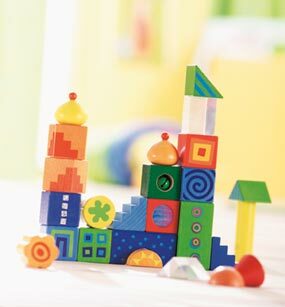 These blocks transform their first buildings into authentic little artifacts of many shapes and colors. The little bell provides them with incidental music. Building blocks of beech wood and acrylic, some with foil coating. 26 pieces. Basic measurement is 1.5".